A subscription is a safety net. It’s peace of mind in the event of an emergency. 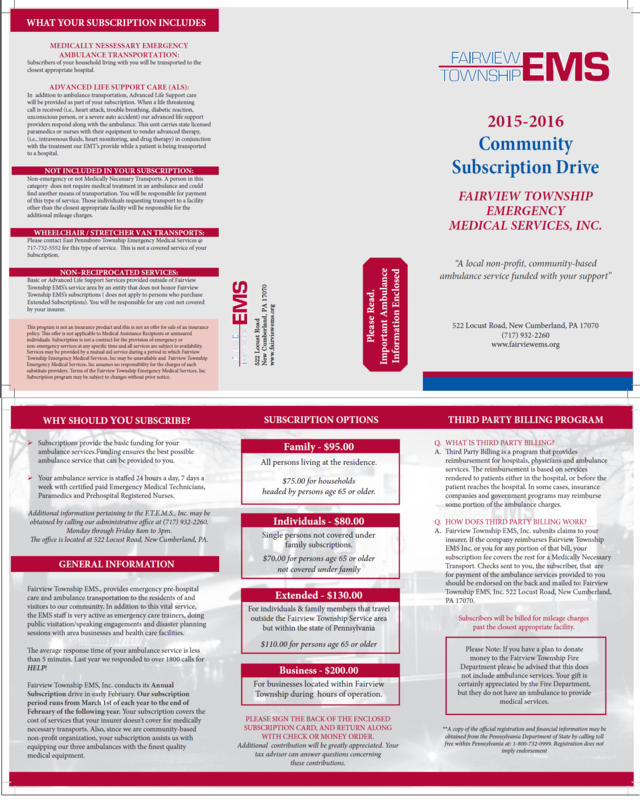 Depending on the type of subscription you have, Fairview Township EMS will cover up to you and your family, anywhere in the state of Pennsylvania, should the need for emergency ground transport by ambulance be necessary. Most insurance companies do not cover the entire cost of an ambulance transport. This can leave you with the leftover bill, which can still be a sizeable amount. With a subscription, whatever amount is leftover is forgiven and considered paid in full. A subscription is considered a donation to the organization. What Different Kinds Of Subscriptions Are There? Take a look at our brochure to see all of our subscriptions and choose which one is right for you. Subscriptions last from March 1st through the following February, regardless of when the subscription is acquired. Is There Anything Subscriptions Don’t Cover? Regardless of which subscription you choose, subscriptions from Fairview Township EMS do not cover aeromedical transports, non-emergency or inter-facility transports, or transports that occur outside of the state of Pennsylvania. Further your subscription dose not cover services provided to you that are deemed not medically necessary by your insurance carrier. Individuals requesting transport to a facility other than the closest appropriate facility will be responsible for the additional mileage charges. You can stop by our offices during normal business hours to pick up a full brochure, or you can view a summary copy online to decide which subscription is right for you. If you can’t make it to our offices, give us a call and we can mail a full brochure out to you.